One of the UK’s leading science and innovation campuses, Sci-Tech Daresbury, has received planning permission from Halton Borough Council for its next phase of development. The development, called Project Violet, will see the construction of two buildings providing 12,000 sq ft each and one building providing 18,000 sq ft. The buildings will be three storeys high, situated at the gateway of the campus on Innovation Way. The scheme represents the latest phase of development at the award-winning site which has been substantially upgraded and expanded over the last two years. It follows the investment of £20m and the opening of the Techspace One and Two buildings in 2017. Neal Biddle, group development director of Langtree and board member of the Sci-Tech Daresbury joint venture company, said: “This is excellent news. 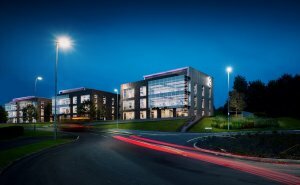 Project Violet will deliver much needed grade A office space in the region and underlines our commitment to building on Sci-Tech Daresbury’s reputation as a place where ambitious businesses can achieve success. “Last year another 30 businesses relocated to the campus and with increasing demand on space, it is critical that we continue to invest in the campus’s infrastructure to help support the economic health of the North West’s economy and that of UK Plc to better compete in global markets.